The rising sea waters will greatly effect the coast of North Carolina. March 30, 2014—-The sea levels are rising as a result of ocean waters expanding due to global warming and the melting of our earth’s ice sheets and glaciers. In past decades sea levels have risen at a rate of 14 inches per century. However, the rate of rise is increasing and expected to rise even more rapidly in future decades. The state of North Carolina, in the eastern United States, has an extensive coastline. Along the coast are a series of off-shore islands known as the Outer Banks. 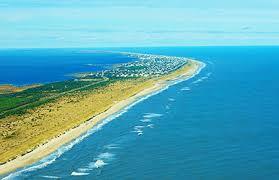 In places the Outer Banks, the sandbars build by storms, are only 300 feet wide and less than 20 feet in height. In the past hurricanes and Nor’easters have sent water over the islands creating new inlets to the sound and closing others. During one hurricane, in 1954, the storm surge was so high that the only land above water on one island was Jockey’s Ridge. This was the hill from which the Wright brothers launched their first airplane flight. If storms 70 years ago could inundate the island, the prospects for future inundations looms rather large. Scientific data shows the impact of the rising oceans. In light of all the debate regarding climate change and the sea , the North Carolina Coastal Commission asked its science panel to examine the effect of rising sea level on North Carolina. The panel prepared a report and presented it in 2010. It estimated that sea levels could rise from 15 to 50 inches in the next century. For planning purposes, the panel suggested a rise of 39 inches by 2100. It was clear from the maps generated that the rise would completely alter the coast of North Carolina. This rise would divide existing banks into pieces and preclude a continuous road along the banks. Coastal counties were suppose to use this estimate to plan future developments of the islands. Immediately the developers and real estate interests began efforts to discredit the report. They claimed that the science of forecasting was not adequate. In 2012 the general assembly objected to the 39 inch forecast and ordered a new forecast. The governor appointed a new person from the coal and gas industry to head the commission. This person promptly reduced the forecast period to 30 years. However, the commission accepted the current estimates for sea level rise. The planning projections were for an 8 inch rise in the next 30 years. To cap the forecasting problem a state law was passed which barred the Coastal Commission from using any forecasts of future sea level rise for a period of four years. Florida Officials Ban the use of “Global Warming” and “Climate Change”. In the U.S. Florida is the state that probably has the most to lose from the rising sea level. Not only does it have a very long coastline, over a thousand miles, but much of the coastline and the area inland is only slightly above sea level. State officials do not acknowledge that the sea level is rising, even though there is clear evidence of the danger it imposes in Florida. The coastal line is already being affected by higher tides and frequent street flooding. Several influential state officials in Florida are anti-climate change. In 2009, Jeb Bush, stated that he was skeptical of global warming and the current governor of Florida, Rick Scott, simply avoided the issue by stating that he was not a scientist. An investigative report published in the Miami Herald determined that in the Department of Environmental Protection, employees were being told not to use the phrases “global warming’ and “climate change’. Additional terms to be avoided were “sea level rise” and “sustainability”. The head of the organization insists there is no department policy to this effect. However, it is clear that the terms are being avoided. Today, the evidence of change due to human activity is clear and its causes have become even more obvious. It seems incredible that states are being forced to make substantial investments to reduce existing flooding as their leaderships make statements denying the causes of the flooding. In many cases, states are using anti-science politics and policies to hide the simple facts of rising sea level. North Carolina and Florida: Addressing changes to the future of the rising coastal waters. Categories: Climate Change, Islands and Climate Change | Tags: Addressing impacts of climate change, Climate change, Florida Coastal Waters, North Carolina coastal waters, Outer banks, Rising ocean levels | Permalink.